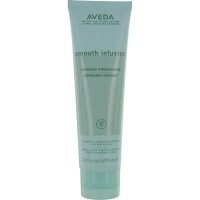 Aveda Smooth Infusion Glossing Straightener. For all-day shine. All-day straightness and shine with an exclusive blend of plant-derived cellulose, wheat, organic aloe, maize and guar bean. Natural cellulose delivers long-lasting hold and maintains a straight style all day. Hydrolized wheat protein protects the cuticle from heat damage caused by hot styling tools. Aroma features a fresh yet spicy citrus-floral blend with rose oil and certified organic bergamot, palmarosa and Australian sandalwood. For best results, shampoo and condition with Smooth Infusion Shampoo and Conditioner and prep with Style-Prep Smoother. Then apply Glossing Straightener to damp hair and style.